by wangdu on March 3, 2017 in News, Publications. So, the whole of society, of civilization, survives by supporting and helping each other. But how can we, as imperfect human beings, offer even an ‘imperfect’ love, and is that enough? Yes, says Rinpoche, we can and should start from where we are. We can offer loving kindness, help and support for each other now, while aspiring towards an ideal unconditional love. Rinpoche encourages us, in these seemingly simple and concise teachings, to develop the courage of a hero dedicated to love, and to find our true brave heart. It is available to pre-order now in the Book Shop. All of Rinpoche’s other books published by Bodhicharya Publications, can also be ordered from the Bodhicharya Publications Book Shop. 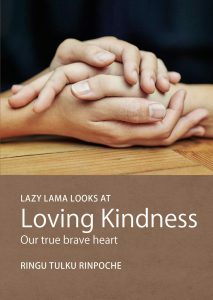 We now offer 7 titles in the Heart Wisdom Series, 7 Lazy Lama booklets and a book of stories.